We’d love your help. Let us know what’s wrong with this preview of Untangling My Chopsticks by Victoria Abbott Riccardi. Two years out of college and with a degree from Le Cordon Bleu in Paris, Victoria Riccardi left a boyfriend, a rent-controlled New York City apartment, and a plum job in advertising to move to Kyoto to study kaiseki, the exquisitely refined form of cooking that accompanies the formal Japanese tea ceremony. She arrived in Kyoto, a city she had dreamed about but never seen, Two years out of college and with a degree from Le Cordon Bleu in Paris, Victoria Riccardi left a boyfriend, a rent-controlled New York City apartment, and a plum job in advertising to move to Kyoto to study kaiseki, the exquisitely refined form of cooking that accompanies the formal Japanese tea ceremony. She arrived in Kyoto, a city she had dreamed about but never seen, with two bags, an open-ended plane ticket, and the ability to speak only sushi-bar Japanese. She left a year later, having learned the language, the art of kaiseki, and what was truly important to her. Through special introductions and personal favors, Victoria was able to attend one of Kyoto’s most prestigious tea schools, where this ago-old Japanese art has been preserved for generations and where she was taken under the wing of an American expatriate who became her mentor in the highly choreographed rituals of this extraordinary culinary discipline. During her year in Kyoto, Victoria explored the mysterious and rarefied world of tea kaiseki, living a life inaccessible to most foreigners. She also discovered the beguiling realm of modern-day Japanese food—the restaurants, specialty shops, and supermarkets. She participated in many fast-disappearing culinary customs, including making mochi (chewy rice cakes) by hand, a beloved family ritual barely surviving in a mechanized age. She celebrated the annual cleansing rites of New Year’s, donning an elaborate kimono and obi for a thirty-four-course extravaganza. She includes twenty-five recipes for favorite dishes she encountered, such as Chicken and Egg Rice Bowl, Japanese Beef and Vegetable Hotpot, and Green-Tea Cooked Salmon Over Rice. To ask other readers questions about Untangling My Chopsticks, please sign up. 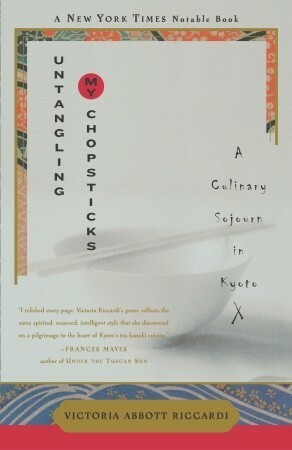 Ever since I read this book, I have wanted to eat a kaiseki meal. That desire is still unfulfilled. There was a kaiseki restaurant in Vancouver when I was there five years ago, but my then-boyfriend had no interest and I did not want to go by myself. The narrator in this book is young, so while she seems to be a lovely person, her voice is not the most compelling. In some ways, this is a coming-of-age novel, which is not my favorite genre. She is, however, a keen observer of a world I will probab Ever since I read this book, I have wanted to eat a kaiseki meal. That desire is still unfulfilled. There was a kaiseki restaurant in Vancouver when I was there five years ago, but my then-boyfriend had no interest and I did not want to go by myself. The narrator in this book is young, so while she seems to be a lovely person, her voice is not the most compelling. In some ways, this is a coming-of-age novel, which is not my favorite genre. She is, however, a keen observer of a world I will probably never get the chance to witness. Victoria moved to Kyoto to study kaiseki, a rarefied Japanese cuisine that grew out of the tea ceremony and that has not been exported to the rest of world. As such, she describes rituals and experiences that I have not seen anywhere else. Untangling my Chopsticks, by Victoria Abbott Ricardi is a delightful book. It made me hungry just reading it. I wanted to change the way I read books (right before bed) so I could actually try and eat after I finished a chapter. I never did change my reading habits, but I will admit to some mightly fine food dreams. I have not tried any of the recipes she posts at the end of each chapter. It isn't hard for me. I know I could cook some of this stuff. Plus I live right beside the First Oriental Ma Untangling my Chopsticks, by Victoria Abbott Ricardi is a delightful book. It made me hungry just reading it. I wanted to change the way I read books (right before bed) so I could actually try and eat after I finished a chapter. I never did change my reading habits, but I will admit to some mightly fine food dreams. I have not tried any of the recipes she posts at the end of each chapter. It isn't hard for me. I know I could cook some of this stuff. Plus I live right beside the First Oriental Market in S. Philly. I just know the time and preparation it takes to make these dishes, and when it is cold I am just not in the mood to take several hours to make certain foods. I have satisfied some of my hungers by going to the Korean place for lunch this week. But that only means I have held the Japanese food hunger at bay. I will definitely have to try out the recipes in this book and see if they taste as good as they sound. I will admit though, as a person who has lived in another country and as someone who stayed in an asian country with a local family, I can say I don't always agree with her. She states that it is zen that made the time complete in Kyoto. But she never visited the zen buddhist version (in a monastary) of tea kaiseki until after she had been away from Japan for many years. She says everything in her life during that time was controlled by zen. She makes comments about how the Japanese do things that I have personally experienced and would disagree with. Maybe it is because as an outsider she never was a full part of the culture. Let's face it, if you aren't Japanese, you are never part of the culture. I respect the reasons and the points she makes about what she has learned, but perhaps if she had someone in her life on the inside of that culture she would learned some things differently than she did. I loved reading about Stephen and his partner and how they had tea ceremonies in their home for guests and visitors. I enjoyed hearing all about how things are placed together in a tea ceremony and why. I felt that the spare lines in her story accented the way life in Japan is lived. But I also felt like there was so much she left out and so much I missed. Perhaps this comes because she wrote it long after she had returned. Perhaps it is because so much in Kyoto society is private and she felt the need to translate that into the book. I will say that the book left me wanting more, much like the tea ceremony is supposed to leave you slightly hungry, making you look forward to the next time you return. An informative and relaxing read for anyone interested in Japanese food culture -- specifically, the tea kaiseke, an intricate culinary, cultural, and spiritual practise around foods served as part of the Japanese tea ceremony. the chapters (the okonomiyaki is delicious!). There are detailed explanations of the foods, and of every element th An informative and relaxing read for anyone interested in Japanese food culture -- specifically, the tea kaiseke, an intricate culinary, cultural, and spiritual practise around foods served as part of the Japanese tea ceremony. the chapters (the okonomiyaki is delicious!). There are detailed explanations of the foods, and of every element that is chosen to enhance them -- the dish wares, serving etiquette, among other rules known by the "tea master." As structured and disciplined as tea kaiseke is described to be, the author relates the details in a personal, relaxed tone, conveying the idea that kaiseke is much more than a food ritual; it is a traditional practise that serves as a kind of meditation and a spiritual path to patience, gratitude, calmness, and enlightenment. As a result of this book, I'd be inclined to try tea kaiseke rather than to feel intimidated by it. Bottom line: I thought the book was a good characterization about how difficult it is to travel to a completely different culture and try to fit in (as opposed to exclusively stay in an expat community and rely on others for the more complicated communications). She learned tea kaiseki (her own goal), integrated herself into the community, and made lifelong friends. What more can you ask? The downside is that the book is not quite as entertaining as or . The author gets a little bogged down in places. However, I did enjoy her descriptions of making friends and making mochi. Easy read, more or less enjoyable. Really enjoy the inclusion of recipes and the way the author's passion and appreciation for good food enjoyed with good people shines through. I'm a grouchy cook and I'm going to make more of an effort to look at cooking as a gift, rather than a chore. Was already excited to go to Kyoto, am now even more so. There were several parts that I felt were both unnecessary and kind of sensationalist, playing on the tired "wow Japan is so crazy and weird" trope that I Easy read, more or less enjoyable. Really enjoy the inclusion of recipes and the way the author's passion and appreciation for good food enjoyed with good people shines through. I'm a grouchy cook and I'm going to make more of an effort to look at cooking as a gift, rather than a chore. Was already excited to go to Kyoto, am now even more so. I've been to Japan and reading this helped bring back a lot of good memories. It's a fun book to read if you want a simple overview of life in Japan that doesn't sound like a tourist brochure or if you need a refreshing review of the culture. The book focuses on tea kaiseki but it does a wonderful job tying in how it relates to the culture, history, and language. Where I marked it down though was that I had to remind myself often to read it. There wasn't a sense of "What's next?" after I finished a chapter. About half way through I was already eyeing my next book to read and wondered if I should start that instead. I think I find this book hard to evaluate because I lived in Japan. Reading it brought back a lot of vivid memories so I didn't want to put it down, but I'm not sure that it was constructed well and would give me the same feeling without that experience. I read this book in preparation for an upcoming trip to Japan. It was mesmerizing to read about Japanese culture and food in great detail. The country is far more compelling than the writer in the end, but I appreciated her detailed observations. if you love food, this is the book for you! Every single page made me crave Japanese food, and by the end of it I felt like Victoria was one of my friends. I really enjoyed the way Riccardi interwove story with history, philosophy with experience. It made for a very easy, yet informative culinary travel book! Victoria Abbott Riccardi wrote Untangling my Chopsticks – A Culinary Sojourn in Kyoto after spending time in Kyoto learning how to prepare chakaiseki (tea kaiseki) with one of the three traditional tea houses in Kyoto. I read the book in preparation for our trip to Kyoto. The writing style is easy to read and Victoria does not big-note herself or inject herself unnecessarily into the account of her time in Kyoto. I was a little concerned when Victoria said that tea is grown on a plant related to Victoria Abbott Riccardi wrote Untangling my Chopsticks – A Culinary Sojourn in Kyoto after spending time in Kyoto learning how to prepare chakaiseki (tea kaiseki) with one of the three traditional tea houses in Kyoto. I read the book in preparation for our trip to Kyoto. The writing style is easy to read and Victoria does not big-note herself or inject herself unnecessarily into the account of her time in Kyoto. I was a little concerned when Victoria said that tea is grown on a plant related to the magnolia but as far as I can tell Camellia sinensis is not related to magnolia, so I’m unsure of how that ended up in the book and I hope that the editor did a more careful job of checking the veracity of other aspects of the book! The clock of life is wound just once. In 1986, two years out of university and restless at her job with an ad agency, Victoria left New York to spend a year in Kyoto, where she lived for a few months with a progressive Japanese couple, the wife (Tomiko) taught English lessons from their western-style home. Tomiko and Victoria became firm friends. There was a great passage where the husband swam on New Year’s Day in an icy cold lake with his swimming group as part of an annual tradition. Victoria describes the participants entering the icy water silently and without the screams that would accompany such a pursuit in the west. I reflected on that observation more than once on our recent trip to Kyoto while observing quiet and discrete Japanese people interacting with great deference towards one another. Particularly I was stuck at Tokyo Disney where Japanese people queued quietly and orderly without the yobbishness and disorder that marks such gatherings in Australia. Victoria attended an elite school devoted to the study of kaiseki, a highly ritualized form of cooking that accompanies the formal tea ceremony. From her adoptive “family” she learned about Japanese home cooking and Kyoto’s food markets. At the kaiseki school, she was introduced to an art form in which everything is symbolic, from the food and utensils to the colors of the guests’ kimonos. Immersion in Japanese cuisine taught her about the country’s history, culture and art as well as its cooking, so that even a meal in an ordinary restaurant left her feeling that she had “visited a museum, heard a fascinating lecture, opened several gorgeously wrapped gifts, and consumed the essence of spring in Kyoto.” In her delightful and unusual culinary memoir she includes 27 recipes. A few are for dishes she was served at a Zen temple, some are from kaiseki meals in which she participated and others are representative of everyday fare. her tip-off from other Guesthouse boarders that the massive food halls in department stores like Daimaru and Takashimaya offer free samples. Victoria sampled sweets, pickles, hot food served by waiters like at a cocktail party. Japanese women would taste the dish and buy some whereas Victoria would slink off to a different section to look for something more affordable. When we went to the Daimaru food hall we did try a few samples but there didn’t seem to be anywhere near as many on offer as Victoria described in 1986. Most tourists who flock to Kyoto miss the city’s small back streets… With limited time, they hit the top ten temples, shrines, museums, and gardens, ticking them off like errands on a to-do list. But to truly feel the soul of the city, you need to tear yourself away from the bright lights and slip into the shadows where you’ll find the shops, homes, and people that embody the traditions and values of Kyoto’s elegant past. This reads like a report. Not much use of narrative devices to make it interesting to read. It's a report about the day-to-dayness of living in Japan. Speaking of living in Japan, Riccardi went to Japan to learn about a specific tea ceremony, and I just don't get it. Why? So what? I'd be bored to death sitting through that type of tea ceremony, probably because I just don't get it. According to Riccardi, the tea ceremony is important because men in Japan "pursue the way of tea as a spiritual art This reads like a report. Not much use of narrative devices to make it interesting to read. It's a report about the day-to-dayness of living in Japan. Speaking of living in Japan, Riccardi went to Japan to learn about a specific tea ceremony, and I just don't get it. Why? So what? I'd be bored to death sitting through that type of tea ceremony, probably because I just don't get it. According to Riccardi, the tea ceremony is important because men in Japan "pursue the way of tea as a spiritual art form" (location 2669). "Tomiko carried three bags, and her mother carried two. I staggered out with four" (location 2168). Why is this important? What is supposed to lead me to? Then we get to the aprons: "She took the denim one, her mother tied on a white one, and I put on the black one printed with dancing pigs" (location 2185). These sentences do nothing to advance the story in any way, and the book is filled with this sort of, well, filler. To be honest when I first started this book I wasn't sure if I would make it all the way through, but it held my attention. I read this book in just over 1 day. It is well written and well paced. Victoria Riccardi’s love affair with Japan started young. Her grandparents frequently visited Japan and brought back souvenirs and stories. In 1991 Riccardi finally got her wish. She was off to Kyoto to study tea kaiseki for a year. Different from the tea ceremony (yes I actually know about that- thank To be honest when I first started this book I wasn't sure if I would make it all the way through, but it held my attention. I read this book in just over 1 day. It is well written and well paced. Victoria Riccardi’s love affair with Japan started young. Her grandparents frequently visited Japan and brought back souvenirs and stories. In 1991 Riccardi finally got her wish. She was off to Kyoto to study tea kaiseki for a year. Different from the tea ceremony (yes I actually know about that- thank you Art History 101 in college) kaiseki’s origins are from the meals that the Buddhist monks ate in the temple. In its more modern incarnation it is a highly specialized ritualized meal. Like many age old traditions it is a dying art, but still taught. Apprenticing with an American mentor who attended the same exclusive kaiseki school Riccardi she begins to learn the intricacies of this ceremonial meal. A truly fascinating view into a tradition rarely seen by Westerners. Riccardi is an engaging narrator and each chapter ends with recipes. While I would probably never eat any of the dishes prepared- Riccardi makes everything sound interesting and her descriptions of the preparation are fascinating. As a Japanophile and a foodie, I enjoyed the way this book helped me recall memories from my own travels in Japan and how it provided recipes to try at home. Personally, I felt that the writing style was often a little too flowery for my tastes and read like prose; e.g. "The sushi gleamed like little gems" or "the night sky was opalescent." I suppose it was meant to be like a love poem to the experience it is describing. If you've never been to Japan though and/or if you're not into poetry, this As a Japanophile and a foodie, I enjoyed the way this book helped me recall memories from my own travels in Japan and how it provided recipes to try at home. Personally, I felt that the writing style was often a little too flowery for my tastes and read like prose; e.g. "The sushi gleamed like little gems" or "the night sky was opalescent." I suppose it was meant to be like a love poem to the experience it is describing. If you've never been to Japan though and/or if you're not into poetry, this descriptive style might make it difficult for you to picture what's going on. Interesting book either for foodies or those interested in Japanese culture, because there's lots about both but not much else. This is a memoir about a woman who spends some time in Japan getting a culinary education in the "tea kaiseki" ceremony, which is a series of specialized dishes served very ritually and ceremonially during the serving of tea. There are different types of tea kaiseki and she learns all about them and how to execute them. The dishes are described in detail and it is very Interesting book either for foodies or those interested in Japanese culture, because there's lots about both but not much else. This is a memoir about a woman who spends some time in Japan getting a culinary education in the "tea kaiseki" ceremony, which is a series of specialized dishes served very ritually and ceremonially during the serving of tea. There are different types of tea kaiseki and she learns all about them and how to execute them. Quite entertaining and perceptive. The author undertakes to learn traditional kaiseki, the refined cuisine of Japanese tea ceremonies. She takes the reader along as she becomes immersed in Japanese culture. This is a highly personal account that reads like a memoir overlaid with cultural observations -- a nice blend. I read this book before taking a two-week trip to Kyoto, and it provided some helpful insights into this very traditional city. In particular, it made me determined to seek out some Quite entertaining and perceptive. The author undertakes to learn traditional kaiseki, the refined cuisine of Japanese tea ceremonies. She takes the reader along as she becomes immersed in Japanese culture. This is a highly personal account that reads like a memoir overlaid with cultural observations -- a nice blend. I read this book before taking a two-week trip to Kyoto, and it provided some helpful insights into this very traditional city. In particular, it made me determined to seek out some of the food she described, such as the Buddhist vegetarian yudofu cuisine. It was slightly ironic that I read this book right after I finished The Omnivore's Dilemma. One of the dilemmas that American Omnivores face is that we do not have a strong food culture. We are pummeled with dietary fads and opposing nutritional information. At the same time, we are able to choose from most any kind of cuisine we feel like eating (depending, of course, on where one lives). This book goes into rich detail on the symbolism and ritual of the Tea Kaiseki in Japan. Fascinating descrip It was slightly ironic that I read this book right after I finished The Omnivore's Dilemma. One of the dilemmas that American Omnivores face is that we do not have a strong food culture. We are pummeled with dietary fads and opposing nutritional information. At the same time, we are able to choose from most any kind of cuisine we feel like eating (depending, of course, on where one lives). This book goes into rich detail on the symbolism and ritual of the Tea Kaiseki in Japan. Fascinating description, though I have to admit, not many of the dishes appealed to my taste buds. Ms. Riccardi's descriptions were vivid. That was what allowed me to get into this book. The food, the scenery, the people... it all jumped out of the page. Truth be told, it doesn't exactly follow a steady line of narration and there is no real "story" to tell, no climax, no resolution. It's mostly her life in Kyoto in the 90's, her friends, and how she learned the art of tea kaiseki. There were times where I felt I was reading a school book on Kyoto. Her voice wasn't very present when she wanted Ms. Riccardi's descriptions were vivid. That was what allowed me to get into this book. The food, the scenery, the people... it all jumped out of the page. Truth be told, it doesn't exactly follow a steady line of narration and there is no real "story" to tell, no climax, no resolution. It's mostly her life in Kyoto in the 90's, her friends, and how she learned the art of tea kaiseki. There were times where I felt I was reading a school book on Kyoto. Her voice wasn't very present when she wanted to get the facts across. And there were a lot of facts. I read this book over several days, and each time I sat down it was like a little journey overseas. Riccardi writes sensitively and sincerely about her sojourn to Japan to learn about tea and food culture. Unlike so many other travel and food writers, she doesn't gush, and I don't find that she romanticizes either. I've since encountered her articles in food magazines and have enjoyed all those as well. She has convinced me of her integrity! Saw this many moons ago in ASH and I finally broke down and bought it when I couldn't find it in my libraries. Worth it - especially the recipes. I may finally try to make oyako donburi which I adore. A nice compact look at one woman's adventures abroad. Gilbert should have read this before trying Eat Pray Love - it might have improved it! This book is a must-read for Japan-obsessed people like myself! At first I thought this book would be a rather boring read, but the author's vivid descriptions and funny narratives made this a book I could barely put down! This book tells the story of the author's journey to Japan to learn the art of Tea Ceremony. Along with her story, the author also tells a lot about Japan's food, customs, and history. Excellent book all around. learning the art of tea keiseki- the amazingly intricate food that is served in a tea house. The attention to detail, symbolism, and Japanese culture is explored and refreshingly shared through the eyes of a young woman. Now, I'm anxious to go back to Japan, with Kyoto as my first stop! As I read this book more and more, I become increasingly dissatisfied by the author's voice. One the one hand, she writes beautifully of food and of the kaiseki culture. On the other hand, I find her attitudes and perspectives of Japanese people and gay characters in her memoir, to be more than a little disquieting. I skip her observations of and interactions with people and go straight to the good parts about meals and cooking. Non-fiction. An American woman spends a year or more in Kyoto for the purpose of studying kaiseki, the cooking that accompanies the formal tea ceremony. And through this pursuit, she learns a great deal about Japanese cooking, culture, history, language, etc. She also makes good friends while in Kyoto. I knew I had missed much on my recent trip to Japan, and this book confirms that for me. I read this on my way to and during a trip to Japan. it was a really great way to gain an better understanding of Japanese gastronomy and culture which, contrary to popular opinion, is not centered simply around sushi and noodle soup. I highly recommend it for those contemplating a trip and those who are interested in food and Japanese culture.